The highest officer, except the president, in the academies of Sura and Pumbedita. In each of the two schools there were seven "reshe kallah," who sat in the first row (called "daraḳamma"), facing the gaon. According to the explanation of Nathan ha-Babli, they were called "reshe kallah" because each of them was set above ten members of the Great Sanhedrin, which was modeled on that of Jerusalem. But the term is really derived from the so-called "kallah" months (Adar to Elul), since it was their duty in the first three weeks of each of these months to explain to the students the subjects which the gaon had selected for his lectures during the following half-year. On the installation of an exilarch a resh kallah read from the Bible immediately after a new resh galuta, and a resh kallah on his death was succeeded by his son, even if the latter was still a minor. In the year 935 a blind resh kallah restored peace between the exilarch David b. Zakkai and the gaon Kohen Ẓedeḳ. Bar Mar Rab Samuel and Mar Rab Amram, both relatives of Sherira, are given the title of resh kallah. The liturgical prayer "Yeḳum Purḳan," dating from that time, mentions these officials. Their names occur in the beginning of every geonic responsum, together with those of the "ḥaberim" and the "allufim." 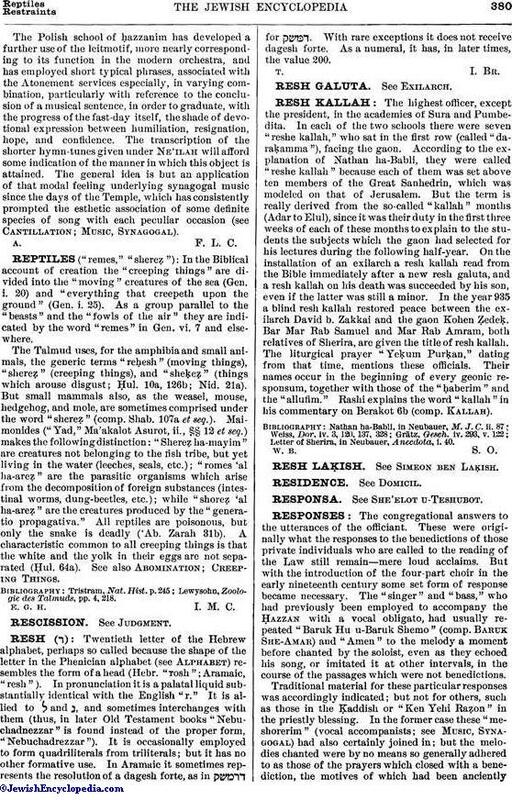 Rashi explains the word "kallah" in his commentary on Berakot 6b (comp. Kallah). Letter of Sherira, in Neubauer, Anecdota, i. 40.